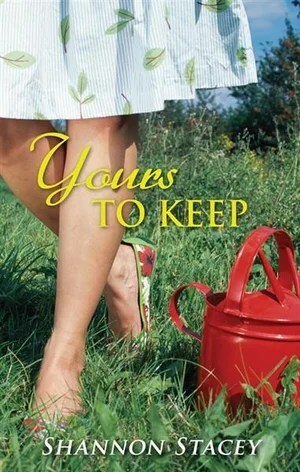 Yours to Keep is a classic “strangers make a deal to pretend they’re in love and then fall in love in actuality” type romance novel. These are pretty common really because it places the protagonists together for extended periods of time and forces intimacy. 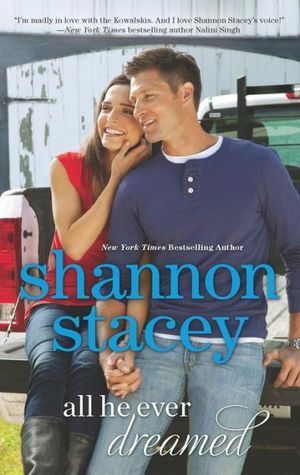 And it works well in this novel by Shannon Stacey. The set-up is as follows: Sean Kowalski arrives home from Afghanistan, his army service over, and within hours he’s recruited by Emma Shaw to be her fake fiancé. In order to give her grandmother peace of mind now that she’s moved to Florida, Emma lies about having a boyfriend (and subsequent fiancé) and having just heard her best friend discussing her cousin Sean, she drops his name and continues to do so for 18 months, crafting network of lies in the meantime. Now, with her grandmother’s upcoming visit only days away, she convinces Sean to fulfill the lies she’s told. He doesn’t like the deception, but being rudderless and freshly back in the States he could use the landscaping job Emma’s offering while he decides what to do with his civilian life. And, despite his attraction to Emma, there’s no chance he’ll fall for a woman with deep roots in a town he’s not planning to call home and she’s not interested in settling down with anyone either. This, of course, means in Romance Novel Land ™ that they will fall in love in 200 pages or less. You know going in what to expect and that doesn’t lessen the enjoyment any. This is also the third book in the Kowalski Family series which means that characters we’ve grown fond of in previous books are back and more characters within the family are fleshed out. I think my favorite of the Kowalski books so far was Undeniably Yours the second book in the series which I read at the beginning of the year, but that doesn’t mean that there aren’t some fun things to be had in this book as well. And really, it’s a close second. Perhaps my favorite device to move the story along was the post it notes that Sean would leave on the bathroom mirror for Emma to fill her in about things. They become integral to the story and highly amusing as well. The other thing I truly appreciate about Ms. Stacey’s writing style, aside from her adroit use of humor, is that her characters exist in a world that is very real. I know above I joked about Romance Novel Land ™ but these characters go to the grocery store, have families, obligations, jobs, bills, headaches, bad days, family vacations, and ride four wheelers. This is much more rooted in real life than many romance novels I’ve read. If you’re looking for an easy read these books are a good choice. I’m going to read the fourth book at some point, as it focuses on Sean’s older brother Mitch. But since it moves the action from New Hampshire to Maine, I’m sure I’m going to miss the characters I’ve come to appreciate. I had to stop it there. I’m not saying it was a bad book, it was a perfectly serviceable rom-com but the story did little for me personally. I decided to pick up this series based on Malin’s review of the second book in the series, Undeniably Yours. It sounded like the kind of story I needed after working my way through Nazi-looted artwork. Light and fluffy here I come! And it was. But, not light enough for me. My brain wouldn’t turn off to simply enjoy the plot and there was some similarly named characters and some age math which just refused to jive for me. But, all that aside, the story of Joe and Keri and their rediscovery of the love they shared as teenagers now that they are in teir mid-thirties certainly kept me interested, and it was nice to see a male protagonist as sexually activated by his female counterpart as she was by him. Something that not enough contemporary romance writers achieve.